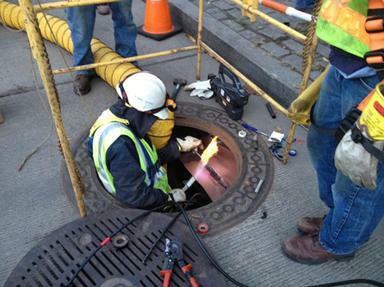 An Indiana Michigan Power Company employee repairs underground network equipment in New York City. AEP workers who have been involved in mutual assistance work for other utilities after Hurricane Sandy and the nor’easter storm in Northeastern states are now in the process of heading home. “Releases have started and company and contract crews are traveling home,” said Jim Nowak, manager – Emergency Restoration Planning. “All employees should be released by Friday.” Some crews have already begun traveling home, while utilities have asked other crews to stay an extra day. Reports from the field indicate that utilities that AEP assisted have been extremely pleased with the safety practices and work ethic demonstrated by AEP workers. At the peak of outages following the Oct. 29 landfall of Hurricane Sandy, an estimated 8.5 million people in the eastern U.S. were without power. AEP crews have been working primarily in New York, New Jersey and northeastern West Virginia. During the restoration effort, approximately 50 percent of all AEP’s company and contract line resources were working in the Northeast. All seven operating companies have been involved in the effort, primarily assisting Consolidated Edison, Long Island Power Authority, Public Service Electric & Gas, and FirstEnergy. Some crews have been away from home for weeks — first assisting Appalachian Power restoring outages in West Virginia and Virginia, then traveling to assist outside utilities further north and east. At last report, AEP Ohio crews have been assisting Consolidated Edison (Orange and Rockland) in New York, and FirstEnergy in New Jersey (Jersey Central Power & Light) and West Virginia (Monongahela Power). Some employees were assigned service restoration work in the Coney Island area of Brooklyn. AEP Texas crews have been assisting Con Ed and FirstEnergy (Mon Power); Appalachian Power crews have been assisting PSE&G; Indiana Michigan Power crews have been assisting Con Ed, FirstEnergy (Mon Power and JCP& L); Kentucky Power crews have been assisting FirstEnergy (Mon Power); Public Service Company of Oklahoma crews have been assisting First Energy (Mon Power and JCP&L); Southwestern Electric Power Company crews have been assisting FirstEnergy (Mon Power and JCP&L). AEP Ohio and I&M underground network crews have assisted Con Ed in New York City. Lodging for AEP crews in the storm-devastated areas included hotels and tent cities set up for storm restoration workers at staging areas. It is nice to see the folks get some positive comments . A job well done. I’m glad our Company was able to provide assistance.